Hey Everyone. I'm new here. I hope this is the right place for my post. If not, perhaps you could point me in the right direction. Previously I posted this inquiry on the Welcome Mat, and Cuboid was kind enough to provide some info and try to help, but we couldn't nail it down. 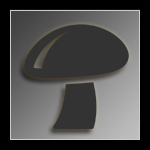 I want to place this in Gymnopilus, but it doesn't seem to fit perfectly anywhere. The cream (?) 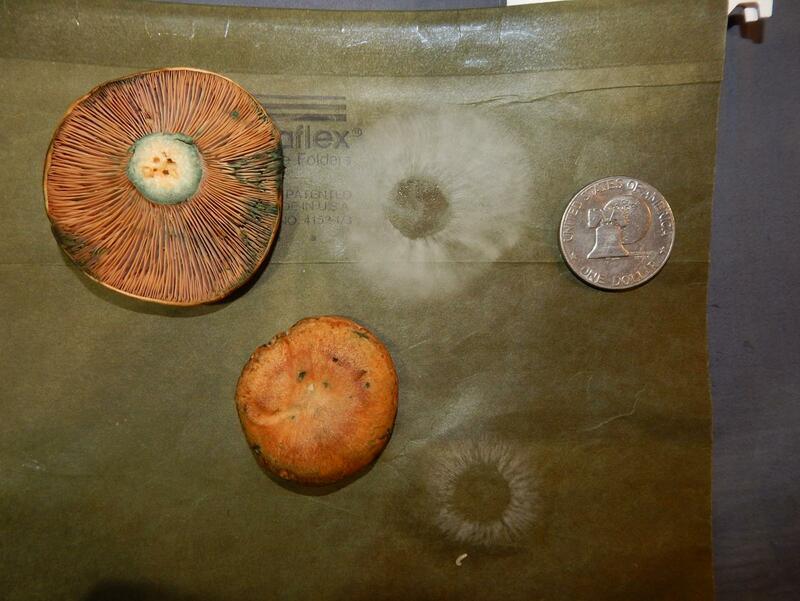 colored spore print seems a little at odds with most of Gymnopilus. I found these in October, on the west side of the Cascades at around 3,500 ft. I started thinking aeruginosis, then moved to luteofolius, in part because of thick, pithy-to-hollow stems, and because MushroomObserver.org suggests that aeruginosis prefers valley floors in my region, whereas it indicates that luteofolius is at home around here in the valleys or in the mountains. But my mushroom isn't bitter (at least not the tiny piece of dried cap I tried), seemed to grow in needle duff rather than on rotting logs, and the spores aren't orange. So now I am wondering if it is a magic sub-type of G. terrestris, which I am under the impression usually does not contain psilocybin (or turn blue). The bluing isn't generally as dramatic as it is on the snapped cap in the photo here. I suspect that was situational. Picked that first batch not knowing what they were, figured I'd try to ID them when I got home from my camping trip. Picked them in the long dry spell following the first rains of the season, put them in a plastic bag, and tossed them in my trunk. Pulled them out the next day and was mystified at how they had turned blue wherever they were damaged. I thought it was a fast growing blue mold at first, but it was only on the one type of mushroom and the other varieties of mushroom in the bag were unaffected. After a little online research I learned what the bluing phenomenon likely meant. While the bluing isn't always this dramatic, it is unmistakable in any sample that I have found. Green splotches on the tops of most mature caps. Gills turn all blue as they break down during extended wet weather (discovered this on a return trip olinfected with some kind of larvae). Stems bruise blue. Any cut surface bruises green/blue/purple as long as it isn't super dry. Any part damaged in handling bruises blue. On the spore print photo I included a 'silver' dollar for scale. Those are two of the smallest caps I collected. Only the smallest ones were still dome-shaped. The more mature ones have caps that are pretty planar. These are big mushrooms. Some of the stems are an inch or so in diameter. Can anyone help me out here? I want to know if they're safe to ingest. From what I see online, the active Gyms tend to run about half as potent as cubensis, gram for gram. If these aren't some kind of active Gym, then what else grows in the Pacific Northwest that's big and orange, gilled, and stains blue? Thanks for any thoughts/insights/opinions you would be willing to share! Hey jkdeth. Thanks for the input. But these ones I've got don't 'milk' when cut. As an overarching characteristic, don't all the lactarius species ooze when cut? I understand there is a Lactarius indigo that is blue, but I don't think any Lactarius bruise blue, do they? Edited by TheDonger, 02 November 2018 - 04:05 AM. They don't always show milk. Some do bruise green. And the spore prints fit. Interesting stuff. Always something more to learn. You might wanna look at Inrolled Pax too. I thought Lobsters at first glance, and they might be Russula Brevipes that is just starting to colonize the orange Hypomyces fungus that turns the Russulas into the Lobsters. That is the thing about mushrooms, so many look alikes. BTW, I did not go look up the spore prints for the suggestions I put out here, just off the cuff might be's and not a for sure branding. I am learning a lot but still learning. The inrolled pax or poison pax looks similar to the Russula but has the edge rolled down like that is where that came from. Thanks for the suggestions, jkdeth and Coopdog. I am confident it's not a russula. These orange mushrooms aren't fragile relative to other mushrooms, like russula. 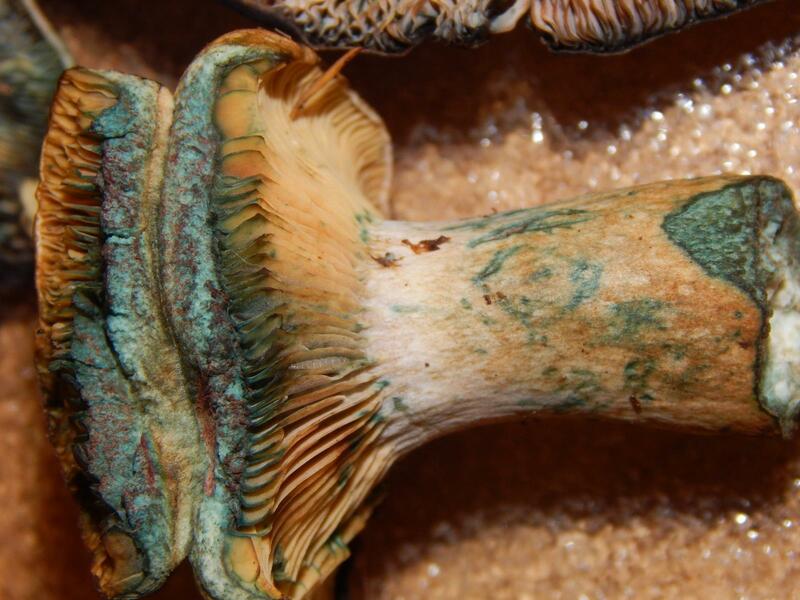 The gills attach to the stems, and the stems do not separate easily from the caps. They are also much heavier/denser than comparably-sized russulas. 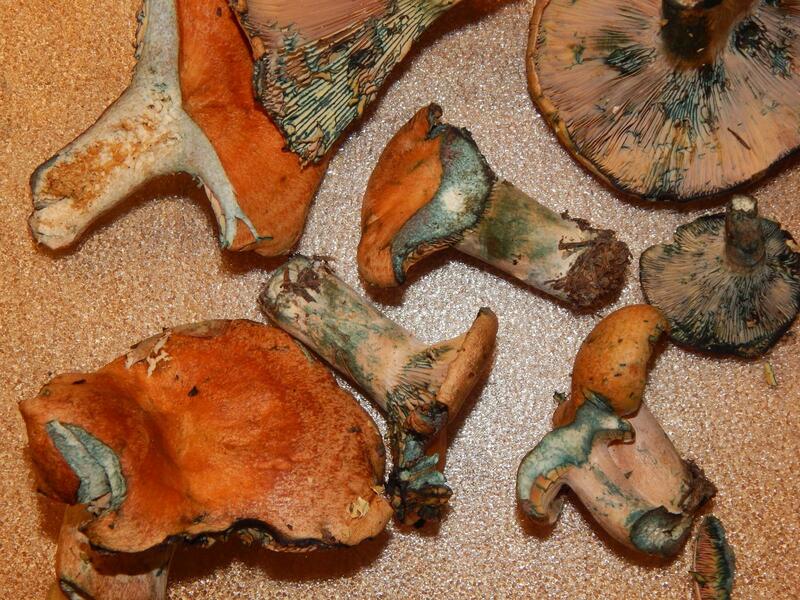 If anybody has info on particular lactarius species found in PNW, that bruises blue and does not weep any milk when cut, then please send me a link if you would. If I google "blue bruising lactarius" or "blue staining lactarius" then all the hits seem to be for Lactarius indigo, and I am very confident that's not what I've got. My mushrooms don't ooze anything when cut or bruised under normal circumstances, and never stain your fingers. I tried seeing if I could dry some water-logged samples in a vacuum chamber (it was a mistake, incidentally, might work as a last step, but not a first step in drying) and clear watery fluid (definitely not latex) was drawn out of them under a near-perfect vacuum. I'm still leaning towards some variety of Gym, despite the beige spores. Kind of hoping a Gym expert or some dedicated PNW magic mushroom hunter will find this post and know these shrooms. I think it's safe to say that if it doesn't bruise (not bleed/seep/ooze) blue and have gills, then it's not my mushroom. Mystery solved, I think. Jkdeth was on the right track with Lactarius. AlderLogs recognized them as Lactarius deliciosus in a parallel post I made. Alder Logs says they're a personal favorite. I was hoping for magic, honestly, but I can be happy with tasty. I'll probably try the KOH test on them to get one more data point supporting that ID. Another note, I hesitated to say Deliciosus, it fits well, except that its usually attributed to Europe. But it fits so well, I dug around quite a bit and it seems that are a couple varieties on the west coast that aren't fully and officially identified, but are effectively the same. Looks more like Lactarius rubrilacteus than L. deliciosus. Check to see if it is red or orange when first broken. L. rubrilacteus is mycorrhizal with Douglas fir.